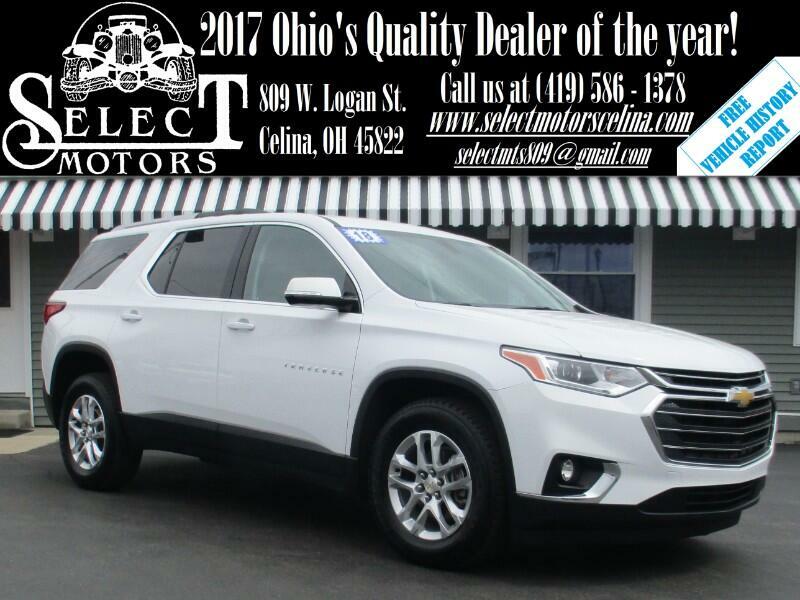 ***TXT US @: (419) 362 - 6200*** AWD, Captain Chairs, Navigation capable, heated cloth seats, power lift gate, blind spot monitors, backup camera/sensors, keyless entry with remote start, automatic headlights, fog lights, automatic dimming mirror, home link, signal mirrors, dual automatic climate control, power windows/locks/mirrors, AM/FM, SiriusXM, auxiliary/USB port, steering wheel mounted audio controls, Bluetooth, power seat with power lumbar, tilt and telescopic steering wheel, cruise control, information center, 18" alloy wheels. Fuel Economy: 18 city / 27 hwy. Warranties: Balance of Chevy's 3 year or 36,000 mile bumper to bumper and 5 year or 60,000 mile powertrain. In service date: 06/27/2018. Extended service contracts available. The 2018 Chevrolet Traverse boasts seven trim levels: L, LS, LT Cloth, LT Leather, RS, Premier and High Country. These trims run the gamut from reasonably well-equipped to luxury SUV competitor. Most of these trim levels are fitted with a V6, but the sport-styled RS trim is unique in that it comes with a torquey turbocharged four-cylinder engine. The standard engine for the Traverse is 3.6-liter V6 (310 hp, 266 lb-ft of torque) paired with Chevy's new nine-speed automatic transmission. Most trims can be had in either front-wheel-drive or all-wheel-drive configuration. While it may be the base model, the Traverse L comes respectably equipped with LED running lights, xenon headlights, heated mirrors, 18-inch wheels and engine stop-start. Inside, you get cloth upholstery, a tilt-adjustable steering wheel, seating for eight, a rearview camera, OnStar communications (with a 4G LTE connection and onboard Wi-Fi hotspot), Chevy's Teen Driver system, and a 7-inch MyLink touchscreen infotainment system with Android Auto and Apple CarPlay connectivity. The L is only available in front-wheel drive and doesn't have access to most optional extras. It's a build-to-order trim, so you're unlikely to ever even see a Traverse L on a dealer lot. Functionally, the LS trim will be the base trim you'll likely come across. The LS has the same equipment as the L, but can be had with all-wheel drive and a few optional extras, such as second-row tablet mounts with dedicated USB charging ports and a cargo management package. Stepping up to the LT Cloth gets you second-row captain's chairs in place of a bench, reducing seating capacity to seven but improving accessibility and comfort. The LT Cloth also gets roof rails, mirror-integrated turn signals and a power-adjustable driver seat. Two notable options packages are available for the FWD Traverse Cloth. The Convenience and Driver Confidence package adds rear parking sensors, blind-spot monitoring, rear cross-traffic alert, a power liftgate, remote engine start, an upgraded 8-inch infotainment touchscreen, a color driver information display, and heated front seats. It also includes some active safety features: blind-spot monitoring and rear cross-traffic alert and rear parking sensors. The Trailering package adds a trailer hitch and heavy-duty cooling system. Note that optioning the LT Cloth with all-wheel drive gets you the Convenience and Driver Confidence package standard. The LT Leather, in either front- or all-wheel drive, gets the Convenience and Driver Confidence package and adds navigation functionality to the MyLink system. It also gets some luxury upgrades. These start, as you might expect, with leather upholstery and continue with a 10-speaker Bose sound system, a 120-volt power outlet, an auto-dimming rearview mirror with a built-in rearview camera display, a top-down parking camera system, and a power-adjustable passenger seat. A panoramic sunroof is available as a stand-alone upgrade. The RS trim receives a turbocharged 2.0-liter four-cylinder (257 hp, 295 lb-ft of torque) and is only available in front-wheel drive. It is equipped much the same as the LT Leather, but with unique styling cues and accents, including 20-inch wheels and a blacked-out grille and bowtie badge. Near the top of the range, the Premier trim adds LED headlights, auto-dimming side mirrors, hands-free operation for the liftgate, ventilated front seats, heated rear seats, a power-adjustable steering column, and driver-seat memory settings. Major packages for the Premier include the Driver Confidence II package, which adds forward collision alert with pedestrian detection and low-speed automatic braking as well as lane departure warning and intervention. There's also the Redline Edition package, an appearance package that blacks out all the chrome trim and adds the panoramic sunroof. Adding all-wheel drive to the Premier trim gets you the Driver Confidence II package, Trailering package and adaptive headlights. The range-topping High Country comes with all the Premier's goodies and adds a special all-wheel-drive system with an auto-locking rear differential, along with automatic high beams, the panoramic sunroof, adaptive cruise control, a power-folding third-row seat, and unique interior leather upholstery. It can only be had with all-wheel drive.